Not sure I have ever seen so many forecasts of 10-20" inches of rain. Isn't that usually a look back after forecasting potential heavy rains and getting even more? Does anyone know the rain predictions for TS Allison? I think that was the on that flooded most of Houston a couple of years ago. I remember Allison dumped over 40 inches on us back in 2001. Don't remember the predictions but I don't think it was even close to the massive amount we got. I agree, that's what I find concerning. Seems like the predictions weren't much more than a typical tropical system dropping a lot of rain. I don't think the forecast was for 20" and Houston ship channel recorded almost 40. Recon is finding that the system again has a closed circulation, although a broad/elongated one. NHC to begin re-issuing advisories on Harvey at 10AM. Supposed to fly to NY on sat at noon! Rainfall totals still looking extreme. This from this morning's GFS. I have info regarding the forecast but need 5 posts to attached the link. Here is 1. My concern would be the amount of development over the metro area both commercial and housing since Allison. All that area that has filled in between 99 and beltway 8. All that water is diverted somewhere and it has to go to the coast. 20 inches now could be worse for this city than 40 was way back when. Last edited by Ætheling; 08-23-2017 at 07:50 AM. 5th post. Info 30 seconds out! This was a report from the Us Department of Commerce as a Service Assessment to the impacts of Tropical Storm Allison in 2001. On page 17 there is a recap in regards to the actions taken as titled "Tropical Prediction Center". In the 4th paragraph it reveals that the initial Tropical Storm Warning for Allison predicted for 5 inches of heavy rainfall. (That was predicted at 2pm the afternoon of June 5th - the day of landfall) 2 hours later they predicted a forecast rainfall of 8 inches in isolated areas. 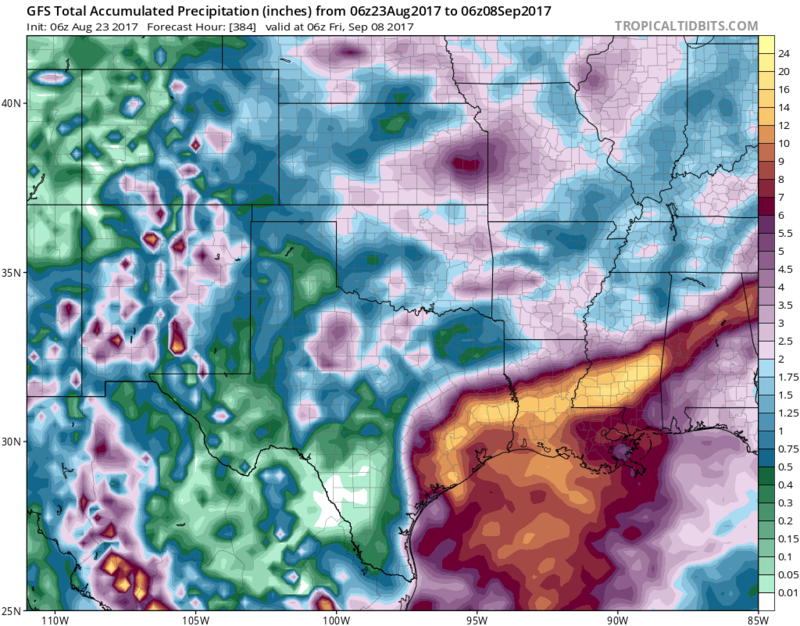 The report continues to read on and explain that the forecasts were updated through the storm, but no where does it mention a 3-4 day future forecast that called for the amount of rain projected for us with Harvey. My point is this: When Allison was coming they did not expect near the rainfall that they actually received. Now granted this was technology that is now 17 years old, but if the models for Harvey continue to spit out the data they show today we could have our hands full. Either way, be safe and plan for the worst. You can never be over prepared. If we ever get the rain we did in 1994 Houston and surrounding areas are done. Allison dropped a lot of rain and did some damage as well. With all the "development" the next big rainmaker is going to open some eyes to the effects of paving everything in sight. So I'm supposed to be in Bellaire for Lasik at 8-10AM Saturday then leaving and going back around 4PM Saturday. Traveling down 59 from Shepherd, should I reschedule? um yeh ...unless you drive a submarine. Problem with Allison is that heifer hit, sat, backed back out, regained some strength and hit us again. No it won't. People know the effects but they keep doing it anyway. June 9th, 2001 I still have nightmares. 10 million gallons of water in my office and labs. Took me 3.5 years to get back into my office. We don't want that again!! We already had this May 2016...20" of rain in Katy. Search for Memorial Day Flooding in the old threads. Had boats going down Avenue D.
Bottom line is, no area is built to cope with 20" of rain, especially with the lack of elevation change near the coast. Whether or not something is paved only helps to a certain extent, as we saw about a month ago in Katy, where 5-6" flooded some roads. 20" of rain shuts anything down. Those are 2-week rain totals. Local news this morning said 10 - 15" over the next 7 days. I'm not excited about this either (was supposed to go to the lease this weekend and finish my stuff), and I certainly want to be prepared, but y'all are working yourselves into a tizzy and there's still a lot of uncertainty at this point. How bad does the flooding get around the nrg Stadium with this amount of rain fall. Kind of what I figured! Dang it, this was the last weekend I had free to get it done before deer season. This is true, BUT, with all the new roads comes new structures. The added water shed to the area in forms of roofs, streets, driveways, parking lots etc. play a major roll in compounding the situation. Not to mention new levies that have been constructed. My thoughts exactly, with 99 complete and all the deforestation in Humble by the Costco we're going to see something new I reckon. 99 ****ed up a lot of run off... it floods consistently on 99 now on just light rain...making it impassable in some spots..
That's "progress" I'm sure the area being developed in Humble is going to compound the issue further. Kind of suprised to see how well organized the system looks at this time compared to last night, and early this morning. You can clearly see a Low level circulation, with deep convection just to the east of it really starting to pop. As well as beginning to see the banding features, and cloud base expanding. The LLC is to the SW side of the big blob. Lots of Convection to the N&NE of the LLC, so you can see how areas N & E of where ever this goes will get a lot of rain. That's why progress was in quotation marks. Seems like a huge rainmaker will wash all that out. When it settles who knows the river could be completely rerouted. So long as the guy on the hill (developer) is making his $$$ who cares. It's sad really. Last edited by arrowsmack324; 08-23-2017 at 08:51 AM. Agree. I think the destruction of the rice fields is really the main cause of flooding in Katy. They used to be able to hold water, now they are gone. Soils in this part of Texas are expansive when they get wet, which seals off most ground penetration after just an inch or two of rain. So the amount of run off is similar to paving after just a little rain. But I think the rice fields north of Katy played a huge role in holding back some of that water, far more than ground penetration. Sorry, getting off topic. Keep the weather info coming! Last edited by WItoTX; 08-23-2017 at 08:52 AM. Reason: . Model homes were flooded in some of the new developments. Who on God's green earth would buy a house in a subdivision that has flooded even before full development? Sorry for the derail, I'm glad y'all are providing such great info about the coming system. I'm putting my soap box up. so yall are saying i probably shouldn't drive out from Houston to New Orleans on Friday, and back to Houston on Sunday? Driving across the gulf coast during a hurricane would be a bad idea? Am i reading this correctly? Na you're good. Sounds like the making of a good song! Hurricane making landfall between CC and Victoria Friday evening. Weakening to TS or TD as it drifts up the coast. May re-enter the gulf near Galveston Monday and make final landfall in Louisiana Monday night. Perhaps something akin to "The Wreck of The Edmund Fitzgerald"?